This is a quick, easy dinner served over rice. When I’ve got a crazy softball schedule for the girls, I’ll “bread” the chicken before practice or the game and make the rice ahead of time. When we get home, it’s a matter of quickly cooking the chicken and reheating the rice. Simple! 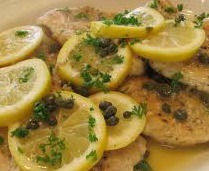 3 chicken breasts – slice these in half horizontally so that they are really thin. That’s the key to cooking them quickly. If your chicken is not thin enough (about ¼”), cover it with parchment paper (or whatever’s available so it doesn’t splatter everywhere) and pound it with a meat tenderizer. If you don’t have one, smack it with a heavy pan. Sprinkle some salt and pepper on each cutlet, then dip them in the flour on all sides. At this point, if I usually need to taxi kids, so I’ll cover it and leave it in the fridge until I’m ready to sauté. Game’s over, kids played great! Time to get back to dinner prep. Heat your olive oil up in a large fry pan add the chicken. Cook about 3 minutes, flip them over and cook for another 2 minutes. You want them to look golden brown. Remove them from the pan, place on a plate and cover with foil. THEY WILL NOT BE COOKED THROUGH YET. Deglaze the pan with the wine, adding the garlic and scraping up any brown bits. Cook until the wine is nearly evaporated. Add the broth, lemon juice and capers. Return the cutlets to the pan and cook for another couple minutes on each side until they are cooked through (no longer pink inside). Cooking time will vary depending on the thickness of the meat. Remove pan from heat, stir in chilled butter until melted. Serve over rice with sauce over the top. Enjoy!